Yesterday, President Obama took the oath of office for a second time. While there are so many teachable moments in this historic event, as a literacy teacher, I'd like to focus here on the inaugural poem. 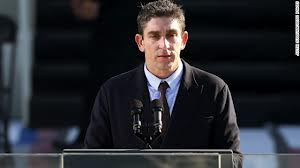 Richard Blanco crafted an homage to the American people very reminiscent of Walt Whitman's "I Hear America Singing." I might first ask my students to make a text-to-text connection between these two poems. Then I'd like to focus on the beauty of Blanco's simple language, and his elevation of the mundane, "din of honking cabs, buses launching down avenues, the symphony of footsteps, guitars, and screeching subways, the unexpected song bird on your clothes line." to the glorious. Read the full text of "One Today" here. Read "I Hear America Singing" here. Enjoy!